Modern Bushcraft is a tradition as much as a sport. It follows a regime of survival skills derived originally from Bushmen of the southern hemisphere. It's mainstreamed today by UK resident Ray Mears through his televised programs outlining how to thrive and survive with only a knife both skillfully and comfortably in nature. Spyderco's version of a Bushcraft knife results from a three-fold collaboration between Tactical Bushcrafter Chris Claycombe, a Bushcraft website called BushcraftUK.com and Spyderco designers. Knives used in the practice of Bushcraft have specific parameters such as possessing blades between 4-6 inches. 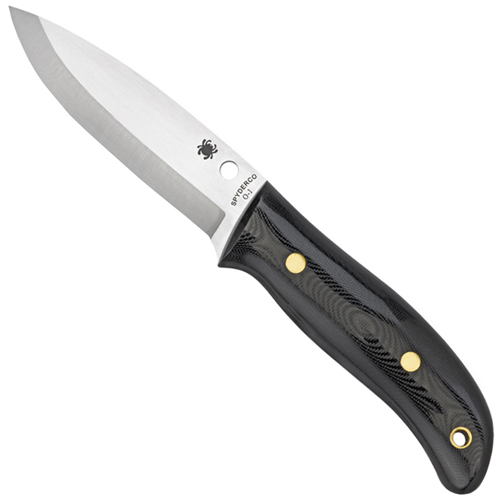 Spyderco's is typical of the genre with a 4-inch blade (no handguard) that's fully-tanged. The blade is a Scandinavian or Scandi grind. Scandi edges have a single bevel grind, wide and flat that cuts with strength and is able to withstand twisting and hacking. The blade is made from O-1 tool steel. Bushcrafters generally don't seek the characteristics of stainless over the performance of high-carbon edge retention, and is why traditional Bushcraft knives are produced using tool steel for their blades. O-1's high carbon content holds a long-term edge but also sharpens easily when laying on a new edge. 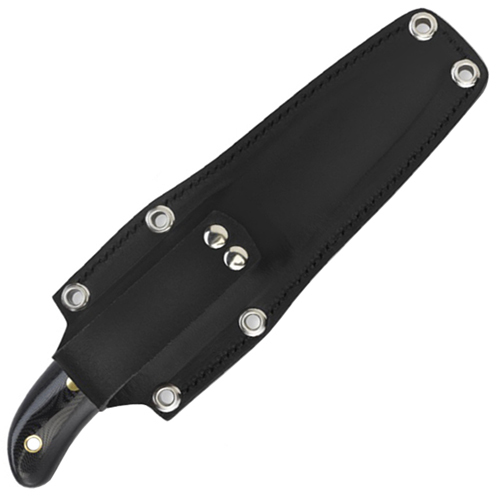 The black G-10 handle is contoured for comfort with a backup lanyard hole and the knife carries in a leather sheath. It is overall blueprinted for performing wilderness chores such as slicing, chopping, whittling and game processing all done in traditional Bushcraft style.